Hi! Has the dust cleared? Thank you so much for the overwhelming response to the knit night cupcakes. I don’t quite know what to say! Perhaps we should just move right along and talk about something new and totally different. Raw food. I admit that I used to think about raw food the way that many omnis think about vegan food in general. What do you eat? Could it really be good? I couldn’t possibly make it myself – it seems too hard. Then on a trip to San Francisco a few years ago, my eyes were opened. My husband and I went to the San Francisco Vegetarian Festival and there we tried some raw cheesecake from Alive. We were stunned. So stunned we had to find out if they had a restaurant. And they did! We went there that night for dinner. I was admittedly nervous. Having never eaten fully raw meal on purpose, I had no idea what to expect. At that point I hadn’t even seen recipes, cookbooks or blogs about raw food. I had only been vegan for five or six months, so a lot was new to me. We ordered a dehydrated cracker pizza starter. Stewart had a fettucini alfredo and I had a sundried tomato lasagna. We also had two tall glasses of almond milk to wash it all down. Dessert was a chocolate-y pie. How is it that I can remember every detail of a dinner I ate more than three years ago? IT WAS AMAZING! That’s how. You would think I would have delved into the world of raw food right then and there, but it’s taken me three years to decide to try some raw meals every once in a while. So here is my very first attempt! I blended the brazil nut based sauce in a brand-spankin’ new vita-mix (thank you to my husband for that!) and used a mandoline for the cucumber noodles. I know most people use zucchini for raw noodles, but all I had on hand were cucumbers. They were very wet, so I rolled them up in paper towels while I was preparing the rest of the dish; that seemed to help the texture immensely. It ended up being a really simple dish: cucumber noodles, fresh sweet corn kernels, the sauce, and some fresh mint and basil from my garden. I loved every single bite, and I can’t wait to make more raw food! Not only does it sound absolutely delicious but it’s beautiful as well….. It looks great…raw food sounds like a good fit for summer, even if you didn’t keep it up year ’round. Mmm that looks so good, though I don’t like mint that much, maybe basil? I’ve been interesting in raw foods for a while now, and Rawfoodtalk.com has a great message board (and it’s free) with lots of fabulous recipes you maybe be interested in. That looks delicious! My favorite restaurant is raw– it’s all so good. I only eat there a couple times a year because it’s far from my house, but when I do I’m always floored. Actually, you might know about it. The Organic Garden Cafe and Juice Bar in Beverly. The town’s not very nice but it is the best food ever. I highly recommend you check it out. They make a Goddess Pate that’s incredible. I should make raw foods occasionally, too. You just inspired me! Thanks! 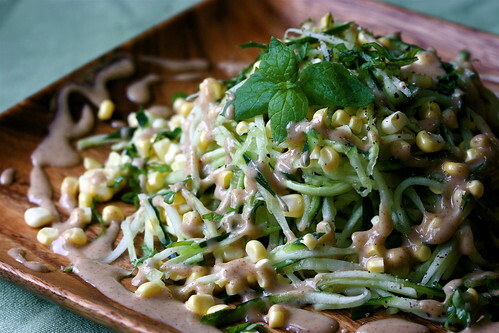 I don’t think I could go totally raw but I’ve seen several good-looking raw recipes! This one is one of them! I should probably give raw food a try…but to be honest, I don’t really beleive it’s as healthy as some say..but who knows. Your dish looks beautiful! Could you possibly post a recipe for the sauce? It looks wonderful, and I love cucumbers. Great photos. Looks so yummy! i second the request for the sauce recipe — would definitely like to try it. I’m a raw foodist and I was so thrilled to see you included a dish on your vegan blog. “Vegan” is really not as exclusive a diet as some people think these days — it’s sort of an umbrella term for more specific diets, like macrobiotics and raw. I think you’re doing a fantastic job expanding your repetoire to all aspects of the “vegan” choice. Everything is beautiful and joy to read! What a great website! We’ve been eating raw for the past 6 weeks and the health benefits have been awesome! Your dish looks to cry for – would you mind sharing the recipe for the sauce? a friend of mine sent me a link to your site – she’s a knitter. i’m sure you can see where i am going with this…. however, i cruised your site because i am a vegan, and have been for almost a year and a half. looked at raw, but was daunted. thank you so much for sharing your creativity and commitment to a healthy lifestyle. i am going to try some of your recipes! thanks so much! ps – i too, would like to see what else the sauce has in it besides the brazil nuts…. I live in San Francisco & Alive is till on my “to do” list! ack. I do go to Cafe Gratitude though, their taco salad is amazing! I’ve wanted to make raw foods at home as well, but find it daunting. Raw seems like a good break from some of the carb loaded vegan dishes I see out there. I really like using vegetables as my bulk versus soy products. awesome! Next step… raw fruitarian? November 21, 2007 - 8:53 am Pingback: Cookthink: Is there a corn pudding in the house? Hi Lolo! Just found your blog today and wanted to tell you what an amazing job you do. Your dishes look incredible and are so inspiring! Keep up the raw creations too! Your dish looks amazing. I am currently on a juice feast so I am not eating. When I was eating raw before that I used to make pad Thai with cucumber noodles. It was delicious especially on a hot summer day. The only down side is the water that gets released when you add the sauce. It seems like you had a good solution. Thanks so much! this inspired me to free form my own version of a sauce using soaked sunflower seeds and a few brazil nuts for my base (more local to where I live in the midwest)–thanks for the motivation! i used zucchini noodles, and heck, why not throw in a tomato. delish. What is the recipe for the dressing? I didn’t write it down, sorry! Wow, it looks fabulous! 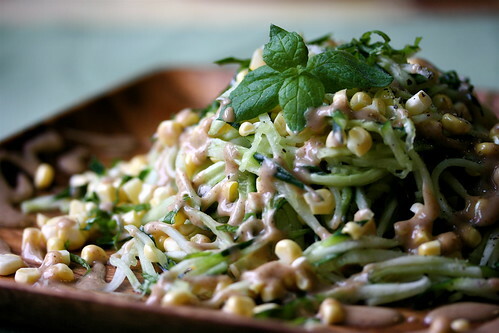 I always makes my raw pastas from zucchini, but your cucumber version really makes me want to try it.